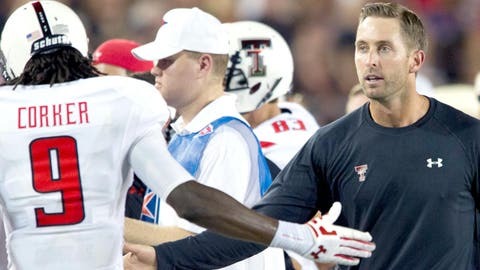 Kliff Kingsbury created some buzz in Lubbock in his first year at Texas Tech. Clay Travis’ guest this week on Outkick the Podcast is Texas Tech coach Kliff Kingsbury. The matinee idol in Lubbock — and around the rest of college football land — spoke of his rise from a $400 a month position at the University of Houston to guiding light for Johnny Manziel at Texas A&M to head coach of the Red Raiders. Travis also asked the Texas Tech coach about how he would have handled being the Heisman winner at 19. "I would have been in jail, would have quit, would have rode off into the sunset…" he said with a laugh. But there was one question that Kingsbury evaded. And it is probably the one that a large part of the audience is curious about. To find out what that is and much more about this rising star in the coaching ranks, download this week’s Outkick the Podcast on iTunes or listen below.